For any Minnesota airport, winter is a hard time of year. Snow storms, freezing rain and sub-zero temperatures pose problems for even the most advanced snow-fighting operation. For Minnesota's many local airports, the challenges winter brings are even tougher. Many get by with just two or three dedicated maintenance staff, while others have no assigned staff. Instead, local transportation agencies must keep these airports safely plowed in addition to their countless other winter weather responsibilities. At LTAP's Fall 2008 Fall Maintenance Expo the Metropolitan Airports Commission's Joe Harris, the City of Hutchinson's John Olson and Mn/DOT Office of Aviation's Rick Braunig shared strategies for effective local airport snow removal. Pre-season planning is the key to successful airport winter operations. Planning should be completed as early as possible; July is a good time to start. 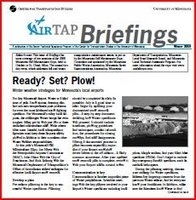 Begin by updating your documented snow removal plan – a step-by-step document detailing how airport winter operations will proceed. It should include timelines, plowing guidelines and techniques, important contact information, the procedures for closing runways and staff assignments. Having a documented process in place becomes especially important if your airport snowplow driver leaves in the off-season – a fairly common occurrence. After your updated snow removal plan is complete, review it with your airport traffic control tower. Communication is another important piece of winter preparations. Schedule meetings with the key players involved in your airport's winter operations including local pilots, hangar tenants and your fixed base operators (FBOs). Don't forget to include any emergency aircraft operators, such as medical helicopters. During the planning meeting, discuss your strategy for winter operations, address any lingering concerns from the previous winter season and let everyone know your limitations. In addition, make sure the attendees know where to find information, updates and answers to their questions during winter events. After the meeting, send out a letter to all your tenants and key players explaining the winter operations plan and providing important contact numbers. Remember to communicate with your maintenance staff during pre-season planning. Schedule a formal training for drivers who will be maintaining the airport during the winter season. Use the training to review the snow removal plan, familiarize the drivers with any specialized equipment and conduct a dry-run of airport plowing operations. The off-season is also the time to make logistical preparations for winter. Begin by considering last year's winter operations and identifying where there is room for improvement. If you had a problem with drifting snow, ask a farmer to leave some corn standing near the runway or draw up a plan to create a snow fence. If drainage was an issue, give your culverts a good cleaning. Make sure you have adequate supplies of sand and a warm place to store it. Clearly mark any obstructions that could interfere with plowing. Finally, test all your equipment, and consider adding to or upgrading your equipment if possible. Keep these important airport snow removal strategies when creating your snow removal plan and dealing with a winter weather event. Communicate. Just as communication is important in pre-season planning, it is also crucial during an actual snow event. When closing a runway for plowing, be sure to transmit a NOTAM (Notice to Airman) in advance in the closure, and don't open the runway before it is fully plowed. Always check to make sure the NOTAM is posted and removed – an aircraft attempting to land while plows are working is dangerous situation. Skip the salt. A good street plowing is not the same as a good runway plowing. Never use salt on a runway. Instead, use sand or a chemical specifically designed for airport use. Salt is not allowed on runways, taxiways or ramps. Think like a pilot. When plowing, remember the sides and ends of the runway must be cleared. Pilots need to see the runway lights from the air, and snow banks should be far enough back to provide plenty of wingtip clearance. Early in the season, push snow drifts as far back as possible. Once snow banks are established, it can be difficult to push them farther from the runway. Pay attention to details. Don't forget to plow around lights and navigational aids, and clear the sensors on the automated weather observing station (AWOS). When plowing around lights and signs use caution, because the force of a plow can easily break them. Give pilots somewhere to go. Finally, remember to clear more than just the main runway, or you leave pilots with nowhere to go. A good guideline is to plow your main runway first, followed by the taxiways, aircraft loading areas, public roadways, secondary runways and taxiways, hangar taxi lanes and finally vehicle parking areas.